Let’s face it - kids are unpredictable. This is why finding the right diaper bag is so important. From diapers to bottles and snacks; a good diaper bag allows you to carry more so you can worry less. Diaper bag backpacks combine the best of both worlds by giving you the functionality of a diaper bag with the hands-free convenience of a backpack. But finding the best unisex diaper bags that look good on both mom and dad can be a challenge. Fortunately, gender neutral diaper backpacks do exist! The best unisex diaper bags are ones that get the job done without compromising on quality, functionality and style. In this buying guide we explore unisex diaper backpacks from some of our favorite brands. Functional. Durable. Stylish. The Bagitalist Multifunctional Unisex Diaper bag is one of our most recommended unisex diaper backpacks on the list and it’s easy to see why. This gender neutral diaper backpack has been designed from the ground up to carry all the essentials without looking like your typical diaper bag. It’s stylish enough to be taken just about anywhere while still fitting 16 pockets for everything from bottles, snacks to diapers and baby wipes. Ramhorn hits a home run with a unisex diaper backpack that is practical as it is stylish. One thing we love about this backpack is the generous front pocket that includes easy-access mesh pockets for essentials and three separate bottle holders. The bottle holders themselves are insulated to keep liquids cool or warm for hours at a time. Inside you’ll find waterproof compartments that keep wet and dry item separate. Available in multiple colors, this Ramhorn backpack is perfect for those on the hunt for cute unisex diaper bags that will look great on both mom and dad. 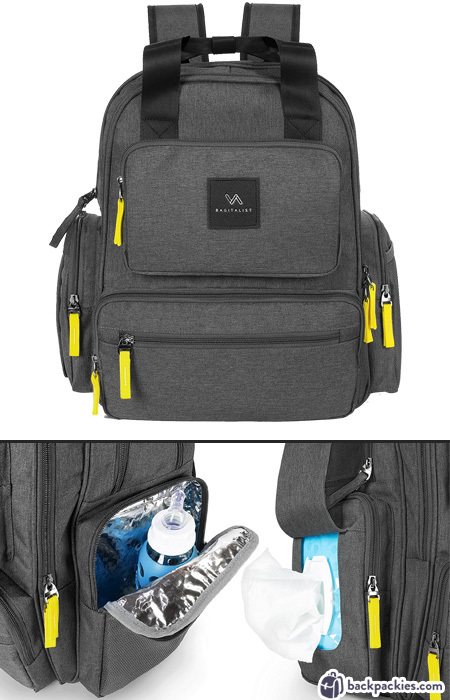 Bag Nation offers a durable diaper backpack that is made to tackle even the longest days. It’s unisex backpack diaper bag design allows it to be carried by just about anyone. The inside is packed with must-have features such as an insulated bottle pocket, dedicated baby wipes pocket and a generous main compartment that opens flat for easy access to items in the bottom of the bag. The bag itself is made of a water-resistant and highly durable twill polyester that will hold up to years of use. The Jeep Perfect Pockets backpack is one of the most popular diaper bags on our list and it’s easy to see why. Features include 12 organization pockets, stroller loops and an included changing pad. The side pockets include a baby wipe slot and a hot/cold insulated bottle pocket for quick and easy access. With so many compartments and features, the Jeep Perfect Pockets backpack is the bag for those looking for affordable unisex diaper bags that can do it all. What makes this Fisher Price unisex diaper backpack so special is that it was designed by parents for parents. Features like an insulated side pocket, pacifier pocket and dedicated diaper pocket make this backpack a must-have for parents who want quick-access while on the move. The Fisher Price diaper backpack is available in multiple colors that are both stylish and gender-neutral. This backpack is perfect for moms and dads looking for affordable unisex diaper bags that don’t compromise on features. Skip Hop Duo introduces a unisex backpack diaper bag that both mom and dad will love with their Signature Carry-All backpack. This diaper backpack looks like a stylish backpack on the outside while having all of the features you need on the inside for a day out with your little one. Some of our favorite features include a side pocket for bottles, special d-rings for toys or pacifiers and a padded pocket for both the included changing pad or a laptop. This Skip Hop Duo bag also includes stroller straps and a padded top handle when you want to switch up your carry. The Graco Gotham Smart Organizer diaper backpack is perfect for parents looking for affordable unisex diaper bags that don’t skimp on features. The backpack includes awesome features such as a wipe dispenser side pocket, insulated bottle pocket and organizational front pockets to store snacks, pacifiers and more. A large interior pocket means more room for toys, clothes and diapers while a padded back and shoulder straps makes for comfortable carry wherever you roam. And since the backpack is made out of a durable and sleek black polyester, the Graco Gotham makes a great unisex diaper backpack for both moms and dads. This diaper backpack is designed to hold all of your baby essentials and more. It includes 4 insulated bottle holders, a dedicated pacifier holder, multiple wet/dry compartments and even a hidden pocket to stash valuables. Each backpack even includes a changing pad and stroller straps for even more convenience. Aside from it’s functionality, one thing we love about this diaper backpack is it’s neutral unisex design that looks great on both moms and dads. Add in a lifetime warranty from the manufacturer and you have a must-have diaper backpack that’s ready for life’s adventures. Multiple wet/dry compartments keeps dirty items separate. The Obersee Bern is a sporty unisex diaper backpack that’s made for parents on the go. The backpack itself is made of durable polyester and built around functionality. Ergonomic shoulder straps and a padded back panel means all-day comfort when out and about with little ones. One of the coolest features of the Obersee Bern is it’s detachable insulated cooler that can be strapped to the front of the bag. Each cooler can hold up to three bottle or snacks. What we love most about the Obersee Bern backpack is that it’s designed to be useful beyond your child’s diaper bag years. From a padded laptop compartment to a special organizational front pocket for pens and other adult items, the Obersee Bern is built to be an everyday backpack as much as a diaper backpack. Older PostOgio Renegade vs Gambit backpack comparison - What's the difference?